It was an emotional day for many in Saugus, who paid their respects to Bruin, a police dog diagnosed with an untreatable form of cancer. A Massachusetts community helped its police department say goodbye to its K-9 that had been battling an untreatable form of cancer with a final ride through the town on Thursday. Saugus Police K-9 Bruin's "One Final Ride" kicked off just after 11:30 a.m. with a procession of 30 police cruisers taking him through the streets of Saugus and other North Shore communities until they reached the VCA Wakefield Animal Hospital in Wakefield in the early afternoon. 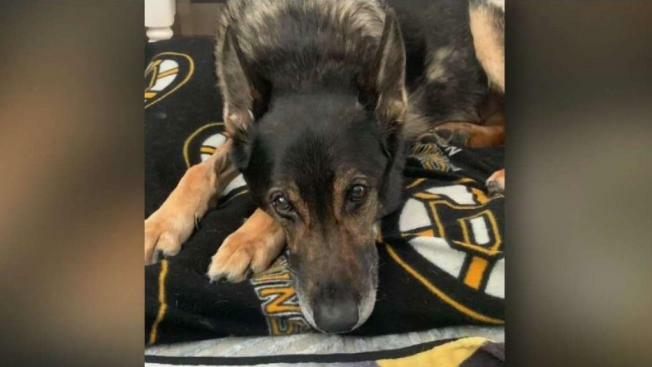 Bruin, a 9-year-old German shepherd, was diagnosed with an untreatable cancer in February, according to officials, and his health quickly declined. He was 9 years old when he died Thursday. NBC10 Boston's SkyRanger caught residents lining up along the streets with signs and waiving as the cruisers went past. "We fully support the police all the time, but this is something special," Tina Obdens said, who lined up outside town hall. "It's an unconditional love, I think. We want him to know that we appreciate him, his service and everything that he did for us." The K-9 joined the Saugus Police Department in February of 2011, when he was 16 months old, and attended training with his human partner, Officer Timothy Fawcett. NBC10 Boston spoke with Fawcett after the procession. 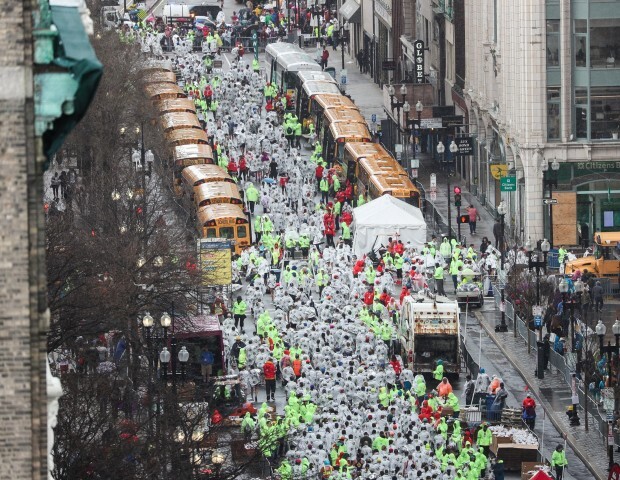 "I've never seen an outpouring like that in my life," Fawcett said. "I feel, sadly, so happy that I was treated like that, my family, my dog, the tribute alone was unbelievable." In addition to being a patrol K-9, Bruin was also trained to detect narcotics. "He had a big heart, but he could do his job," Fawcett said. "He was just a wonderful animal and I feel so blessed." Bruin, who was also an ambassador for the department, enjoyed "a special place in the heart of the community," Saugus' interim Police Chief Ronald Giorgetti said. Saugus Police said the department is also planning to honor K-9 Bruin with a memorial service in the coming days.